Watch: ISIS Hates This Bro Because Of What He Does To Them When He Catches Them! Children look under their bed for the Boogey Man. ISIS looks under theirs for this guy. Is he a war criminal or a hero taking a stand against a great evil? We have already established that ISIS are cowards. But we aren’t seeing any desperate last stands by ISIS. We see them hiding among women and children hoping that we value the lives of civilians more than they do. And cowering among civilians in fear of US airstrikes. This guy, who is having a very laid-back conversation while something is burning behind him is speaking a language they understand. His answer to those who call him barbaric is sobering. You don’t know what you would do until you’ve suffered what they have suffered. Speaking to Expressen, he said the beheaded man had been captured in a toilet block. 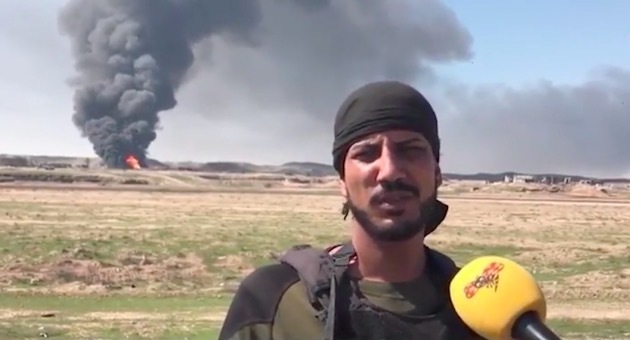 He told war correspondent Magda Gad how it felt to cut someone’s head off. ‘Just that feeling, I can’t explain how at ease I am with it,’ he said. After watching the footage, Donatella Rovera from Amnesty told Expressen it showed ‘war crimes being committed’ and called on Iraqi authorities and the international community to investigate. Like and Follow on Facebook for more. Click here to go to the Warriors & Wildmen Facebook page. Share if it’s hard to feel sorry for ISIS, no matter what’s been done to them. Melania Doesn’t Want To Mingle In D.C. – Do You Blame Her?